Target at-risk populations and advance value-based care through personalized outreach addressing chronic disease and illness. Encourage patients to schedule annual physicals and vaccinations like flu shots. Remind high-risk adults age 55-80 who have used tobacco within the last 15 years to schedule lung cancer screenings. Encourage at-risk patients to conduct regular screenings for colon cancer. Enable self service ordering for at home test (FIT or FOBT). Promote self-management with patient education reminders when it’s time to monitor blood pressure, blood sugar, and other health monitoring. Distribute messages offering self-care reminders, patient education on diet, and symptom recognition. Distribute follow-up communications for diabetic patients reminding them to exercise and eat healthy. Ensure patients under 21 enrolled in Medicaid receive appropriate preventative, dental, mental health, developmental, and specialty services at periodic intervals through early assessment and screening, diagnostics, and treatment. Remind patients with incomplete lab procedures to finish lab testing to avoid delay in care. Deliver perinatal and postpartum messages to women before and after delivery. Interactive messaging with options to transfer to care team or send help hotline information based on need. Alerts and reminders about upcoming classes and meetings. Patient feedback via SMS on attended classes. Communicate with female populations who are due for preventative OB/GYN care, breast or cervical cancer screenings, and other care at regular intervals. Automated SMS Outreach: We use SMS text to communicate with patients because 98% of text messages are read. 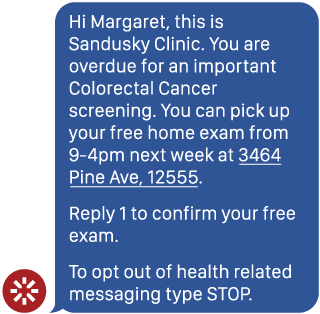 Automatically send a text to patients who are overdue for wellness visits or screenings and chronic disease care. Automated Voice Outreach: For patients who prefer phone calls, we offer automated outbound calling. We’re then able to transfer live calls to your office, so your care team can scale communications to much larger populations more efficiently. Protocol-Based Messaging: You have complete control over the timing and content of your communications to reinforce patient behavior and adherence to care. Filtering: Hyper-target your communications by filtering your populations based on care plan adherence, lab value, geographic location, health plan, age, gender, and more. Multi-Channel Options: We offer text, voice, and email so that you can reach your patients however they want to be reached, whenever you want to reach them.